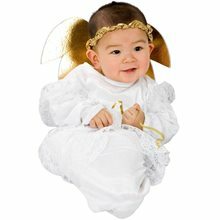 Sailor Bunting Infant Costume.Includes: Sailor bunting jumpsuit and headpiece.Available Size: Infant (0-9 Months). (See Size Chart For More Information)This little sailor is too cute to be stuck at sea! This Sailor Baby Bunting Costume includes a blue bunting and a sailor hat headpiece. Banana Bunting is yellow in color.It looks like real banana.The material of the costume is polyester.It fits 3-12 months. Lil All Star Bunting Infant Costume.Includes: Bunting baseball costume and matching cap.Available Size: Infant (0-9 Months).Care Instructions: Hand wash separately in cold water. Line dry only. Use only non-chlorine bleach when needed. Iron low/cool setting if needed.This adorable Lil Allstar Costume includes bunting and matching cap. 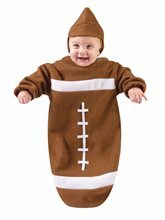 One size fits most up to 25 inches.This infant Lil Allstar costume is sure to be a homerun on Halloween. You are sure to make a hit with everyone!The model pictured is 24 inches, 16 lbs. 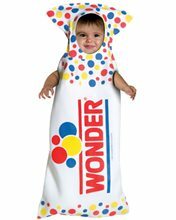 Wonder Bread Bunting Infant Costume.Includes: One piece costume with an attached hood. Available Size: Infant (3-9 Months). *Shoes and Accessories Sold Separately. 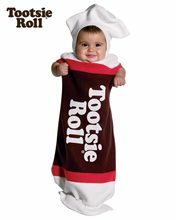 Your baby will now be part of the basic food groups. 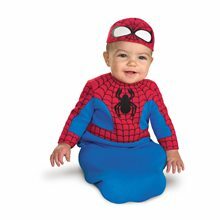 This poly-foam Wonder Bread Baby Buntings Costume comes with a one piece costume with an attached hood. Fits 3-9 months.